Effect of chemical potential on the simulated PDW phase structure demonstrated in the study. The phase of the bond-centered singlet superconducting order parameter, for nearest-neighbors on the 3 × 36 lattice with random pair-edge-field where a larger chemical potential of µ = 6.0 is used rather than µ = 4.6. Here, the line thickness is proportional to the amplitude. The lattice has periodic boundary conditions along the short direction and open boundary conditions along the long direction. Increasing the chemical potential, μ, from μ = 4.6 to μ = 6.0 only enlarges the unit cell by an additional lattice site. Credit: Science Advances, doi: 10.1126/sciadv.aat4698. The isolation of graphene more than a decade ago transformed the landscape of condensed-matter physics, as the single-atom-thick, two-dimensional material exhibited high crystal and electronic quality to represent a conceptually new class of quantum materials. Physicists and engineers have since explored a vast family of two-dimensional crystals known as transition metal dichalcogenides (TMDs) in which electrons exist in layers with insulating, conducting or semiconducting properties, although little attention has been directed to investigate superconductivity in the 2-D crystals. Ongoing work in the field continues to provide surprisingly fertile ground for applications in low dimensional physics. Recent discoveries in high Tc superconductors have resulted in an intense interest in a "pair-density wave" (PDW) formed in Cooper pairs (an electron pair bound together at low temperatures), although there is little theoretical understanding on the driving mechanisms of this exotic state. The complexity results from the many competing states that are in close energy in the strongly correlated region within seemingly simple models and phenomena such as the Hubbard model, frustrated magnets and high temperature superconductors. 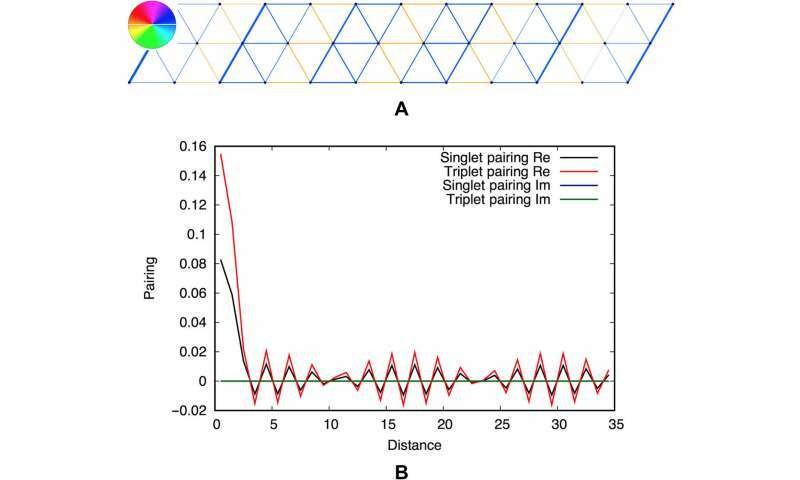 In a recent study, Jordan Venderley and Eun-Ah Kim at the Cornell University, New York, showed that inversion symmetry breaking and resulting spin-valley locking could promote PDWs to overcome the more commonly found spin and charge stripes through frustration against magnetic order. The study detailed the first robust evidence for a PDW in density matrix renormalization of a simple fermionic model via group simulation. The outcomes pointed to an intriguing possibility of the exotic state occurring in hole-doped group VI transition metal dichalcogenides (TMDs) with spin-valley locked band structure and moderate correlations. The results are now published in Science Advances. High temperature superconductors (abbreviated high-Tc) are materials that behave as superconductors at extremely high transition temperatures. The first experimental evidence of superconductors was discovered by J.G. Bednorz and K.A. Müller at IBM's Zurich Research Lab in 1986, for which they were subsequently awarded the Nobel Prize in Physics in 1987. Recent experimental and theoretical developments revived the idea of a regulated or modulated superconducting state that spontaneously breaks translational symmetry. Early efforts on regulating superconductors have closely maintained the principles in the original Fulde-Ferrell-Larkin-Ovchinnkov (FFLO) model, proposed in 1964. An alternative proposal for a modulated paired state for cuprates (materials containing copper anionic complexes) requires a strong coupling mechanism, known as a pair-density wave (PDW), which is distinct from FFLO-type superconductors. Modelling the Fermi surface. (A) The spin-dependent staggered flux pattern for one-spin component with ± Φ flux per plaquette. An opposite flux pattern for the other spin component guarantees time-reversal symmetry. The arrows indicate the direction of positive phase hopping. (B) The Fermi surface in the tight-binding model as derived in the study. Here, the spin-valley locked, circular Fermi pockets are evident. Credit: Science Advances, doi: 10.1126/sciadv.aat4698. The existing need for a strong coupling mechanism led physicists to search for the PDW state in numerical simulations. Present evidence of a PDW in the density matrix renormalization group (DMRG) was only established in the one-dimensional (1D) Kondo-Heisenberg model. Numerical evidence from the controlled approach of the DMRG is, however, lacking in simple fermionic models. A signature difficulty in realizing such a state is due to the presence of spin and charge stripe ground states instead of the PDW state on a Hubbard or t-J model in a square lattice with open-rotation symmetry. The t-J model, first derived from the Hubbard model by Josef Spalek in 1977, described strongly-correlated electron systems to calculate states of high temperature superconductivity in doped antiferromagnets (composed of a few Fe atoms on a surface exhibiting two magnetic states). While many models exist in different branches of physics, the Hubbard model is an iconic and simple contrivance of theoretical condensed matter physics that captures the behavior of correlated electrons in solids as they hop between lattice sites. In the present study, Venderley and Kim therefore turned to a Hubbard model and expected for the frustrating magnetic spin order to nudge systems into a PDW state on a frustrated triangular lattice with broken inversion symmetry. The model captured the hole-doped monolayer group IV TMDs, used as benchmark systems to study and control intertwined electronic orders, fueled by exotic possibilities driven by spin-orbit-coupling (SOC) and a lack of centrosymmetry, alongside superconductivity as observed in preceding studies. Lattice and edge field. A depiction of the lattice in the study. It is periodic in the short direction with three-unit cells and has open boundaries in the long direction. The ellipses on the right signify that multiple lengths are studied: L = 12, 18, 24, 36. The edge field, shown as red lines, is a pair field of the form derived in the study. The nearest-neighbor hopping structure for spin up is also shown with the spin down hopping structure being the complex conjugate of that shown above. Credit: Science Advances, doi: 10.1126/sciadv.aat4698. The DMRG (density matrix renormalization group) is a powerful nonperturbative method used to study strongly interacting electronic systems and explore a diverse selection of strongly correlated, competing quantum phenomena. The DMRG technique was established in the past decade as the leading method to simulate statics and dynamics of one-dimensional quantum lattice systems, with potential for further development. 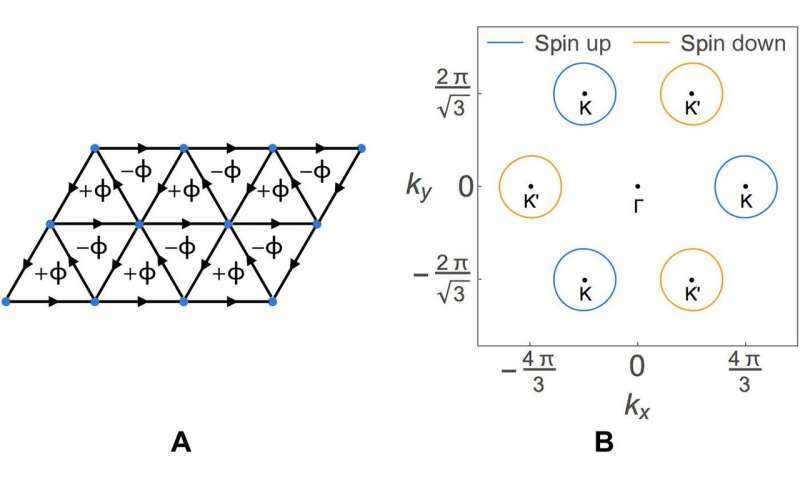 To access the system's superconducting tendencies, Venderley and Kim implemented a pair-edge field motivated by the field-pinning approach, which underlay several previous studies. They biased the system to a specific superconducting state and studied the emergent symmetry of the appropriate order parameter in the bulk to deduce the model's inclination towards various instabilities. The scientists conducted the DMRG calculations and DMRG simulations in two dimensional systems using the iTensor Library developed by Stoudenmire and White. They presented the DMRG simulations in a cylinder with three-unit cells in the periodic direction and 12-, 18-, 24- and 36-unit cells in the nonperiodic direction. The width of the simulation was sufficiently large to sample the pockets in the Fermi surface but not so large as to make the DMRG prohibitively expensive for the computational resources in the lab. Evidence of PDW oscillations. (A) Arg (Δsinglet⟨ij⟩) for all nearest-neighbors with U = +2 for the 3 by 36 lattice simulated with periodic boundary conditions along the short direction and open boundary conditions along the long direction. For visibility, the scientists truncate the plot so that only the third farthest from the edge field is shown. The line thickness is proportional to the pairing amplitude. (B) The scientists plot the real and imaginary components of Δsingletij and Δtripletij for i,j along the middle rung of the lattice to present the phase oscillations. Credit: Science Advances, doi: 10.1126/sciadv.aat4698. To capture the spin-valley locked Fermi surfaces in one-band model in the valence group VI TMDs, the scientists considered a nearest-neighbor tight-binding model on the Fermi surface, where the magnetic flux introduced small amounts of anisotropy in the pockets, analogous to those observed in real semiconductor materials such as MoS2, followed by the inclusion of on-site interactions. In the present work, the DMRG simulation unexpectedly revealed a tendency to break translational symmetry in the repulsive interaction regime to form a modulated pair state, after which the scientists observed evidence of the formation and maintenance of robust PDW oscillations, despite changes (increase) in the simulated chemical potential. This observation by Venderley and Kim was the first report of a strong coupling-driven PDW within DMRG simulations of a simple fermionic model. The phase oscillations plotted in this study, strongly resembled the PDW-type behavior reported in the earlier 1D Kondo-Heisenberg model. Venderley and Kim then Fourier transformed these oscillations to suggest that the infinite momentum of the Cooper pairs originated from the interplay between the Fermi pockets. This view was reinforced when they probed the effect of increasing the chemical potential in the study (which decreased the pocket radius). They then captured oscillations in the singlet pairing strength and in the bond charge density to show that both orders were dominated by the same Fourier mode. Fourier decomposition of the PDW and bond charge order. (A) Fourier transforms of the PDW and charge bond order. Zero momentum, i.e., constant contributions and decay effects have been removed. 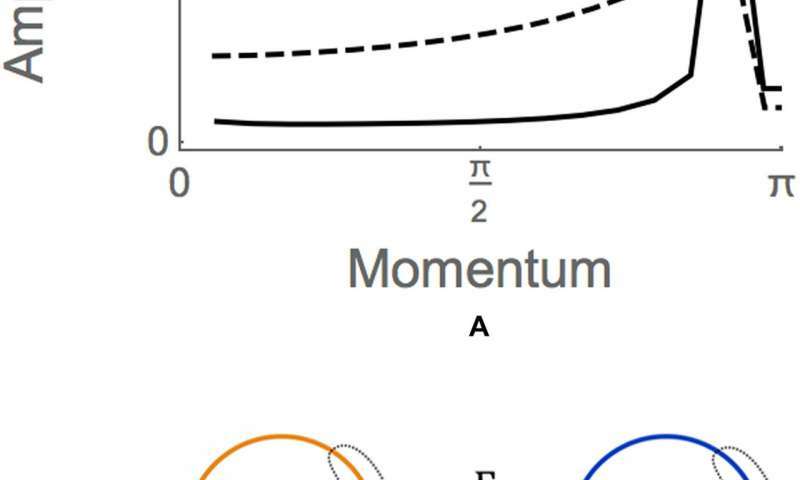 (B) Depiction of pairing in momentum space. The regions demarcated by dashed lines are the approximate pairing regions. Credit: Science Advances, doi: 10.1126/sciadv.aat4698. In this way, Venderley and Kim used DMRG to study superconducting tendencies of a repulsive U Hubbard model on a triangular lattice with spin-valley locking. They probed the tendencies to reveal the complex superconducting phase diagram of the model with translational symmetry-breaking superconducting states; possibly in competition with a uniform state. While researchers are interested in modulating superconducting states, the observed was the first report of a strong coupling-driven PDW formed in a simple fermionic model. Venderley and Kim next aim to investigate if the observed PDW state can be found in a truly 2-D setting by using a different numerical technique such as the density matrix embedding theory that has shown high quality results in 2-D Hubbard models.